In an effort to make this blog 2% less sickeningly London-centric, today I’m offering Ultra Culture readers in ‘that other capital’ a chance to win something cool. 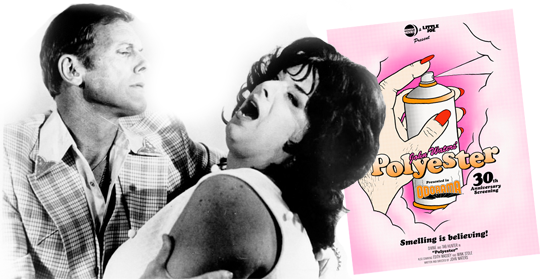 This Friday, as part of the Edinburgh Film Festival, Midnight Movies and Little Joe magazine are celebrating the 30th anniversary of John Waters’ Polyester with a special ‘Odorama’ screening at the Edinburgh Filmhouse. Replicating the gimmick that accompanied the original 1981 release of the film, they’ll be handing out special scene-specific scratch and sniff cards to everyone in the audience. The prize as it stands is two tickets to the screening and pre-film party, a copy of ‘Little Joe’ magazine and a limited edition poster like the one you see above. You’ll have to collect all the swag on the night so don’t bother entering if you can’t make it down on Friday. To be in with a chance of winning, just post a link to a really cute photo in the comment space below. Cutest one wins the prize.